This article was prepared by Brittany Baumann as a requirement for a history class as a sophomore at the Mary Institute St. Louis Country Day School in 2002. Currently, she is a sophomore at Georgetown University in Washington DC. 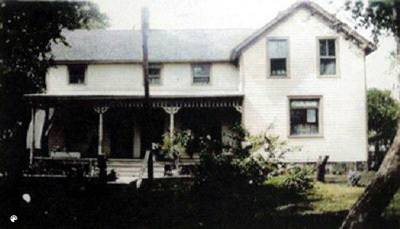 The Baumann family farm originated in Minonk, Illinois in 1857 when Amos Babcock bought the 160-acre farm from the U.S. government. Thirteen years later, Lammert Baumann, a German native, arrived in Minonk and bought the 160 acres from Babcock. For the next 110 years, the three generations of the Baumann family occupied the farm through times of both prosperity and depression. 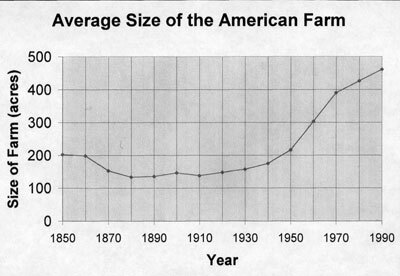 Life on the farm consistently changed during each generation in response to the outside American world. The American economy and technology created changes in the production, landscape, and daily life through four generations of the Baumann farm. Lammert Baumann and his wife, Antje, owned and cultivated the Baumann farm from 1870 to 1904. They farmed corn, oats, alfalfa, and clover. Animals included horses, chickens, hogs, ducks, geese, and milk and beef cows. Income was from selling corn, oats, meat, and milk. Hay (from clover and alfalfa) was needed to feed the horses and, in the winter, the cattle as well. The labor for farming needed manual and horse labor. 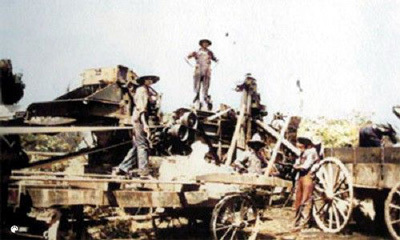 A horse and wooden plow was used to plow the land. To harvest oats, farmers used a scythe to harvest corn, they used a corn-husking peg to shuck the corn. 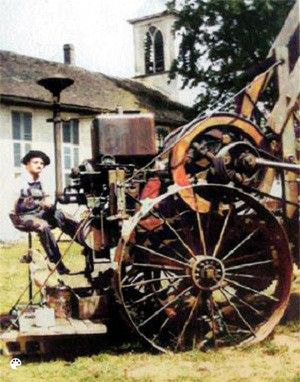 By the end of the generation, Lammert began using a primitive threshing machine to harvest oats shown above. They would collect the corn and oats manually by throwing it into wagons with wooden wheels. The corn was stored in the corncrib to dry. Animal manure was used as fertilizer. There were no insecticides or hybrid corn, which is produced by crossing different varieties of corn. Farming and production was a tedious and strenuous task with a comparatively small output. 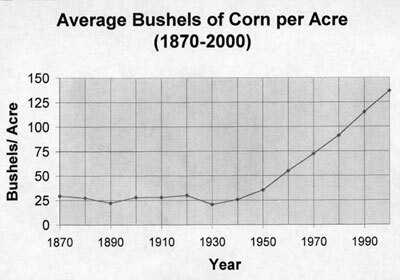 During this generation, the amount of crop produced per acre remained the same, as did the size of most farms, according to Figures A and B. 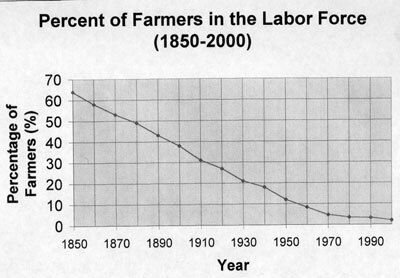 Since the economy was already becoming commercially based, the percent of farmers in the labor force was steadily declining according to Figure C.
When Lammert arrived at his Illinois farm of 160 acres (a quarter of a square mile), the land was fertile but was still at times swampy, for the mole ditchers drained the land for only one season and would then collapse. Mole ditchers were hollow tunnels under the land that drained water to nearby creeks. Around the 1880's, Lammert tiled the hollow tunnels. These clay tiles permanently drained the land because they lasted for decades. The prairie grass was mostly burned down by the early native Indians and there were very few trees and creeks. Thus, Lammert planted many trees on his farm. There were many wild animals: deer, wolves, prairie chickens, and rattlesnakes. 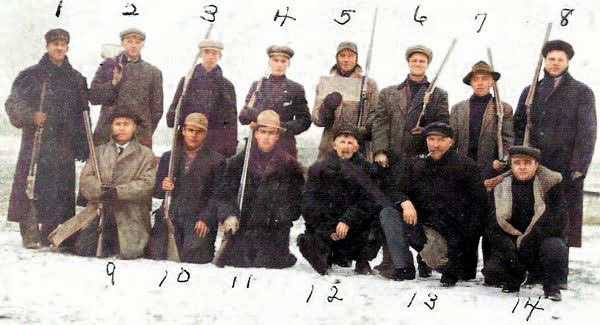 To kill these varmints, Lammert and other farmers formed groups for hunting. During his ownership, Lammert completed the construction of a farmhouse, a windmill, two barns, a tool shed, a hog house, a coalhouse, a brooder lighthouse for the incubation of chicks, a corncrib, and a summer kitchen. The summer kitchen was used for cooking and canning during the summer so the heat would not affect the house. The barn was a shelter for the cattle and also stored hay. He planted orchards of apples, pears, grapes, apricots, plums, cherries, raspberries, and strawberries as well as a vegetable garden. His family could create their own secure food source. The five-acre pasture was surrounded by barbed wire after about a decade of his ownership. The entire farm was gradually surrounded by a long barbed wire fence. The land and farmstead became fully cultivated and developed. The first generation Baumann's lived a strenuous life with no electricity or indoor plumbing and long labor hours. All family members awoke at 5 a.m. to begin the numerous farm tasks, like milking cows, feeding animals, and collecting chicken eggs. 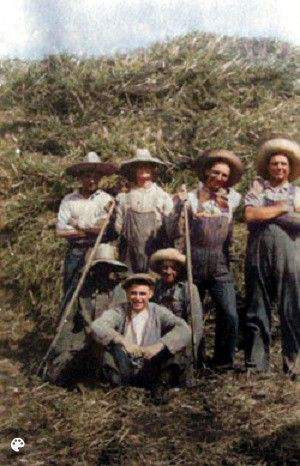 During the growing and harvest season, the men worked all day in the fields. The women usually stayed in the kitchen, cooking meals and canning. The children attended German school during the day. At 5 p.m., the farmers followed the same routine as the early morning routine. In the farmhouse, they had kerosene lamps for light and used coal and corncobs to the heat the house. For drinking water, they used the water that ran off the roof into a cistern. The windmill pumped water to a tank for the cattle, hogs, and horses. When working in the fields, the farmers would bring barrels and jugs of water to drink. Through the entire year, the family had to use an outhouse toilet. Lammert and Antje had nine children, who provided extra help on the farm. They spoke only German and were clearly extremely hard workers.